The development is one of two co-located library/affordable senior housing projects Evergreen has built onthe city’s North Side. CHICAGO, IL—Evergreen Real Estate Group has opened a co-located library and senior housing development, called the Northtown Branch Library, 6800 N. Western Ave., in Chicago’s West Ridge neighborhood. 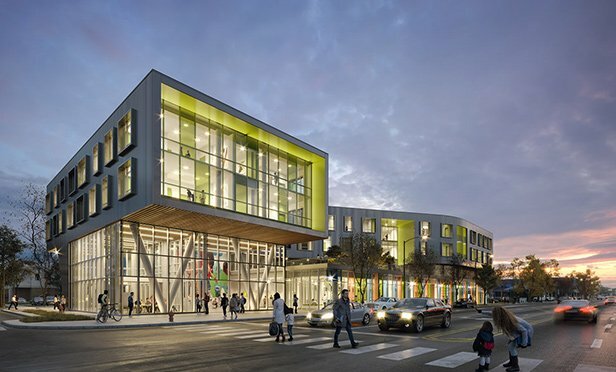 Designed by Perkins+Will, the project is one of two co-located housing and library developments Evergreen is building in partnership with the city of Chicago, Chicago Housing Authority and Chicago Public Library. The project’s residential component, known as Northtown Apartments, will house a total of 44 one-bedroom apartments for low-income seniors, with first move-ins scheduled for April. Earlier this year, Evergreen opened Independence Branch Library, a similar co-located development located at 4024 N. Elston Ave. in Irving Park. Designed by John Ronan Architects, the project includes Independence Apartments, which also consists of 44 low-income senior residences. Those apartments are expected to be completed later this spring. Evergreen is leasing and managing the apartments in both developments.